The San Jose Blog: Newly Updated Downtown San Jose Development Map! Newly Updated Downtown San Jose Development Map! Our good friend Mark from Think Bigger San Jose has done something awesome. He's gone and updated a map with all known development projects in Downtown San Jose, both those under construction and proposed. He has even aggregated the total number of residential, hotel, office, and retail units that will come online over the next few years. If all currently proposed projects come to fruition, Downtown San Jose will get another 7,062 residential units, 328 hotel rooms, almost 2 million SQFT of office space, 348k SQFT of Retail, and two new public parks/plazas. Here is the link to the new Downtown San Jose Development Map! 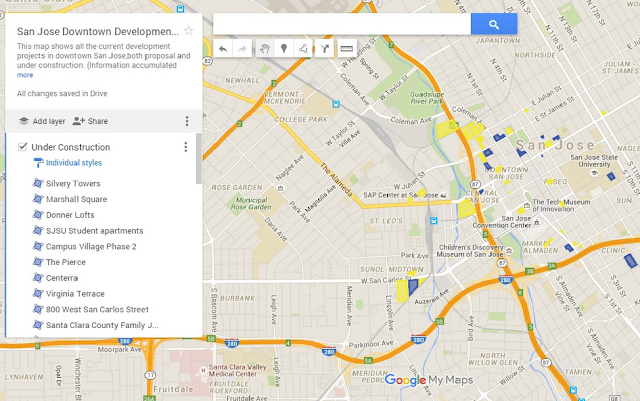 I have also replaced the link on the right in the "San Jose Development" section with the new map for easy access. Very exciting time for downtown!